Five years after the beginning of the Syrian conflict, the Druze show no signs of joining the rebellion. Even calls made by the Saudi-financed opposition, asking the Druze to rise up against the Syrian army, have fallen on deaf ears. Israel’s two-fold psychological campaign – consisting of supporting the Golan’s jihadists on one hand, and positioning itself as the only potential protector of the Druze against these very same jihadists on the other hand – has also failed. Instead, the Druze have consistently joined forces with government troops. Each time the Druze region has been attacked by the Free Syrian Army (FSA), al-Nusra Front or the Islamic State (IS), its inhabitants have relied on the Syrian military to help defend it. In the Province of Swaida, nobody seems to have forgotten the fate of the “Sultan el-Atrache Brigade.” Members of this small Druze unit that joined the FSA were brutally tortured by al-Nusra. Founded in December 2011 by six Druze defectors in Deraa, the faction provided military support to Deraa’s FSA Islamists including “Fajr al-Islam Battalion” during its attempt to invade Swaida in January 2013. But on Jan. 11, 2014, the group was forced to announce its dissolution. Two of its founding members, Khaled Rizk and Bassel Trad, along with a third lesser know member, Raef Nasser, were abducted, tortured and sentenced to death by al-Nusra for their religious affiliation. FSA mediators succeeded in freeing the fighters who were later expelled to Jordan. But the popularity of the fundamentalist trend among the rebels in the so-called “liberated areas” gave the Druze real pause. Those Druze who were critical of the government and eager for national reform quickly learned that there was no room for them among the rebel groups. Abused by the Islamists, disdained by the Gulf States, and limited by their own lack of money and weapons, Druze willing to join rebel militias were few. And even then, they joined the rebel cause only during the early phase of the uprising, when idealism ran high and Syrian unity seemed possible. A few months after the dissolution of the Sultan el-Atrache Brigade, Deraa’s Bedouin stormed Deir Dama village in Swaida province in cooperation with Al-Nusra jihadists, killing several civilians on Aug. 16, 2014. Druze paramilitary fighters and Syrian army members counter-attacked and recaptured the village the following day. This jihadist invasion prompted civilians to acquire weapons. The dismantling of the tiny Druze brigade and the abduction of civilians are far from isolated acts. In the “liberated areas,” the US-backed jihadists and their Nusra allies carried out the religious and ethnic cleansing of non-Sunni Arab populations. For the first time in two thousand years, minorities no longer dwell in much of the area. Last year, in the jihadist-held Province of Idleb, 25,000 Druze were forced to convert to a puritanical form of Islam modeled on Wahhabism. They had to destroy their shrines and to adopt a Salafi dress code and lifestyle, despite the fact that the region’s Druze had adopted a stance of positive neutrality toward the Islamists. As a result, more than half of the Druze in Idleb have abandoned their villages. In March 2016, their lands were confiscated under the fallacious pretext that the owners were fighting alongside government forces. Druze-owned properties were given to Turkmen jihadist settlers armed by Ankara. When the local population resisted the first confiscations on June 11, 2015, 20 Druzes were massacred by a Tunisian jihadist. The killing was condemned by al-Nusra, but the group’s objection was seen as a cosmetic move, similar to its recent rebranding and its pretended detachment from al-Qaeda. Meanwhile in Mount Hermon, the Druze took a completely opposite stance by fighting alongside the Syrian army. They succeeded in repelling the jihadist attacks, except in the village of Mughr al-Mir, which was taken by both the FSA and al-Nusra in December 2014. The population of Mughr al-Mir sought refuge in government-held areas. Jaramana and Sahnaya, two strategic Christian-Druze suburbs of Damascus located in the Ghouta area, also sided with the state army and welcomed hundreds of thousands of refugees from Eastern and Western Ghouta. These two suburbs played a crucial role in preventing the siege that the Saudi-financed militias Liwa al-Islam (renamed Jaish al-Islam) and Ahfad al-Rassoul planned to carry out in the Syrian capital in 2012-2013. In June 2015, the MOC (Military Operation Center), an operational center that gathers US, Saudi, Qatari and Jordanian intelligence in Amman, set up a vast offensive against governmental areas in the southern provinces of Qunaitra, Deraa and Swaida. The operation was aimed at cutting off the city of Deraa from Damascus, installing a rebel footstep in Swaida and in Mount Hermon, and imposing a “security zone” in the south. All three objectives failed simultaneously. 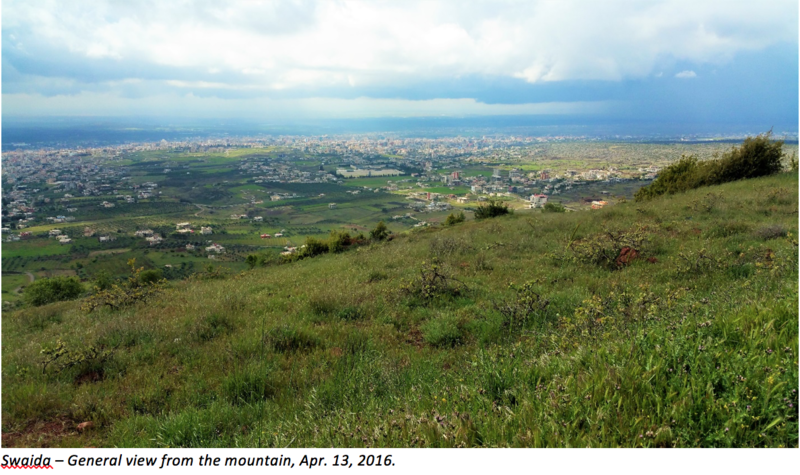 In Mount Hermon, the MOC-backed jihadists encountered a stubborn Druze resistance in the villages of Hadar and Erna. On June 10, the FSA jihadist groups launched a major attack against the military airport of Thaaleh, located in the Province of Swaida. The importance of the military base relies on its proximity to Swaida city. The attack prompted an unprecedented mobilization of Druze paramilitary units and even civilians, who rushed to the airport to support the army. The fighting that lasted for four days and four nights ended with the aggressor’s defeat. This battle represented a turning point. It discouraged the jihadists from further attacking Swaida’s villages. It also reflected the distrust between the Druze and the Islamist rebels, and showed the support that the state army maintains in Swaida and in Mount Hermon. As Swaida’s western borders with Deraa became a de facto military frontline between a pluralistic Syria and a theocratic enclave, another threat came from Swaida’s eastern provincial borders. In this sparsely populated desert called Bir Qassab, a few Bedouin villages sit adjacent to the Druze Mountains. Since 2012, their semi-sedentary tribes, which had until then coexisted in harmony with the Druze, have made a living by smuggling weapons from Jordan to the Ghouta in the suburbs of Damascus. They have traded arms to al-Nusra and Jaish al-Islam. But in October 2014, a conflict of interest encouraged hundreds of members of the al-Hassan tribe to join the Islamic State. After pledging allegiance to the self-proclaimed caliph Abu Baker al-Baghdadi, they launched a series of attacks and attempts to invade the Druze villages of Haqef and Shaqqa, but were constantly repelled by the Druze paramilitary troops and the Syrian air force. The threat of the Islamic State became more acute when Bedouins from the rocky Leja area facing Swaida’s northwest villages, joined the caliphate. The Islamic State attempted to open a military resupply corridor between the Leja in the West and the eastern desert. This route would eventually have cut Swaida’s only highway to Damascus and isolated the province from the rest of Syria. The Druze would have been in a terrible situation. This led the army to reinforce its presence along the highway and to strengthen the defenses of Khulkhuleh’s military airport, located in the same area. Recent battles in Swaida’s villages of Deir Dama, Dhibin, Thaaleh, Mjeimar, Haqef, Shaqqa and Sawara, as well as in Mount Hermon’s villages and in the capital’s suburbs of Jaramana and Sahnaya reflect the prevailing mood among the Druze. Faced with a jihadist onslaught, hundreds of Druze fighters and civilians rushed to support the Syrian army and to repel the FSA’s Islamist and Salafist rebels from their villages and neighborhoods. These successes have boosted the position of the state army and the Druze paramilitary forces, thus accelerating the acquisition of weapons by civilians. In practice, Fatah Al-Sham (ex-Nusra Front), Syria’s most powerful opposition group (apart from the Islamic State, the Muslim Brotherhood and the Kurdish YPG) does not tolerate “apostates.” Its leader Abu Mohammad Al-Jawlani made it clear in an interview for al-Jazeera on Dec. 12, 2015. “As for the Druze, we approach them with Dawah (proselytism),” said the Deraa native leader. “We sent them many preachers who taught them the Aqeedah (Islamic fundamentals) and told them about the mistakes they had made. We noticed that they refrained from these mistakes.” For al-Jawlani, a good Druze is a Wahhabi convert. In this regard, the Muslim Brotherhood pursue a softer strategy by reaching out to non-Sunni populations with Dawah, proselytism, and through the construction of Saudi-financed mosques in their areas. Radical as it may seem, al-Jawlani’s approach is more “tolerant” than the fatwa (religious decree) issued by Ibn Taymiya against the Druze. The 14th century cleric, known as “Sheikh Al-Islam” in the Islamic world, is the ultimate reference for the Salafists and most US-backed moderate jihadists. In his fatwa against the Druze, he said: “Their women are to be enslaved, and their fortunes are to be taken away. They are apostate heretics and their repentance is not accepted. They are to be killed wherever they are found.” For Ibn Taymya, a good Druze is a dead Druze – or a slave. In the neo-Salafist conscious, this religious decree might not be applied literally. But it justifies Fatah al-Sham’s confiscation of Druze lands in Idleb. It also explains why the Islamic State singled out and killed 4 Druze cement workers out of 300 mostly Sunni workers they had abducted in the city of Dumayr, near Damascus, in April 2016. In December 2013, Jaish al-Islam, another “moderate” militia that was recently invited to the peace talks at Geneva 3, stormed the city of Adra, north of Damascus. The US-vetted group beheaded and burned alive – in ovens – dozens of Druze, Ismailis and Alawites, out of thousands of mostly Sunni civilians, who later fled to government-held areas. The religious debate that followed the massacre was whether Islam allows burning people alive. Many Salafi clerics argued that Islam prohibits these practices. But it’s “all right” to behead heretics. Meanwhile, opposition members in exile and some Western think-tanks are striving to either justify the jihadist behaviours in Syria, or to present them as secular and moderate factions. Al-Jazeera even instructed its journalists last year to depict al-Nusra as a moderate group. Regime-change specialists have argued that President Assad is a magnet for jihadists in Syria, and that Syria has become a safe haven for terrorists travelling to US-liberated Iraq, US-liberated Afghanistan, US-liberated Libya, Europe, America, and the entire planet. They conclude that the US must “liberate” Syria as well, in order to free the world from the jihadist threat. In the busy streets of Swaida, life goes on despite the conflict that has claimed more than 300,000 lives. Before the war, the province was home to 400,000 people, mostly Druze originally from Mount Hermon, Mount Lebanon, Idleb and Aleppo, who lived in harmony with a Christian community that traces its origins to the Ghassanids. Since the conflict broke out, nearly 200,000 Sunnis from rebel-held areas have sought refuge here, overwhelming municipal services but strengthening the cultural diversity of this semi-mountainous province. The population and various local non-governmental organizations have mobilized to provide assistance on everything from medical care, to food and shelter. Swaida, with its religious melting-pot, liberal environment and tolerant, inclusive society, seems like the antidote for the Saudi-inspired Salafist culture of the “liberated” areas. It is the antithesis of the US-backed sectarian and misogynist rebellion that has imposed Sharia courts everywhere. Laid back, friendly and welcoming, the Province of Swaida has succeeded, until now, in preserving its Syrian identity. Places of worship like Ain Al-Zaman’s Druze shrine, Saint Paul’s Orthodox church, and Swaida’s central mosque, serve a variety of faiths. Restaurants, cafés, or even Rayyan, the famous nationwide wine and arak brand, offer alternatives for the secular majority. The human losses endured by the province in the conflict, the threats posed by the nearby jihadists, as well as the poverty that has resulted from the war and the Western sanctions, didn’t affect the morale of Swaida’s population. The damascene suburbs of Jaramana and Sahnaya followed a similar path by opening their doors to more than 400,000 internally displaced Syrians. The picture is not all roses, and not everyone is especially fond of the Syrian government and the corrupt local administration. Like elsewhere in Syria, public opinion has become increasingly polarized since 2011. Nevertheless, this rift remains tame, and without much turmoil. There seems to be a near-consensus that the Islamic revolution taking place in Syria is by no means an acceptable option, but rather an existential threat to Syria’s social fabric and very existence. This threat has been exacerbated by the Saudi-sponsored identity crisis in the Near East and Riyadh’s efforts to replace the relatively tolerant Levantine Islam by Wahhabism. The rhetoric of the Saudi-financed Syrian National Coalition centered on tribal and sectarian identities, is widely seen as a form of segregation. The opposition’s media outlets frequently refer to Syrians in Swaida, Mount Hermon and Jaramana not as part of the Syrian majority, but as a “Druze minority.” Their concept of citizenship is based on religious stratification in which sectarian identities supersede the Syrian identity. This leads to the widespread belief that the religion of the so-called “majority” should be institutionalized in the law. A sectarian “democracy” generates segregation, discrimination, social injustice, and prompts disintegration of the social fabric, all the way to community ghettoization. The Islamist notion of democracy is based on sectarian majority rule. 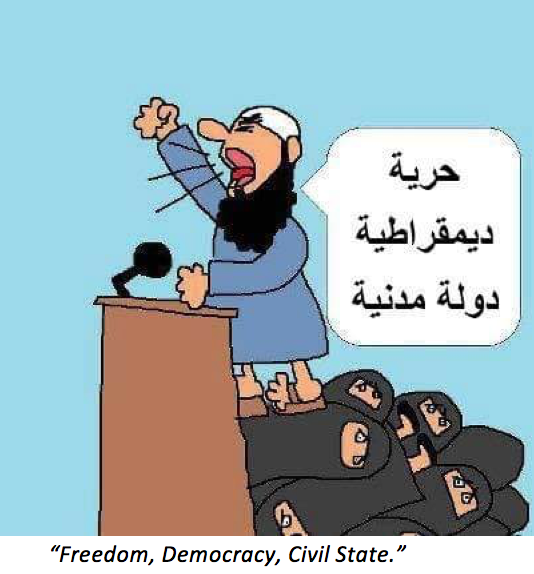 Their support for the implementation of a civil state as an alternative to secularism, is based on a wordplay that leads to “civil state with Islamic reference.” Sharia law is considered to be the foundation of the civil state, which is a return back to square one. The Islamists, like the Israelis in the occupied Golan Heights, have always tried to redefine the Druze identity as a minority or a distinct group, negating the Druze’s century-old combat for full integration within a united, secular Syrian state-nation and society. Both Israelis and the Muslim Brotherhood have strategies that consist of reshaping Syria’s identity and re-tribalizing its society, in order to impose the hegemony of the biggest tribe, namely the Zionist and the Brotherhood communities, respectively. The situation gets worse for women in general. The Brotherhood’s concept of democracy relies to some extent on a misogynistic approach that was born out of a vicious interpretation of allegorical scriptures in the Quran. As a result, the patriarchal system that is based on this interpretation segregates women and limits their role in society. Women are required to follow a strict dress code. They cannot be appointed as judges, rulers or heads of state. Under the Penal Law, a woman is worth half a man. The Law of Personal Status, including marriage, divorce, matrimonial guardianship, inheritance, and nationality, discriminates against women. The unprecedented Saudi-Wahhabi influence has undermined the Syrian opposition and traditional Islam in the Levant. It is also blocking all attempts by Islamic reformists to establish a progressive interpretation of the Quran. The identity crisis promoted by Saudi Arabia in Syria as well as its anti-Shia and anti-everything rhetoric has contributed to Washington and Tel-Aviv’s struggle against the “Axis of Resistance.” By depicting the countries and movements opposed to Israel as a “Shia Crescent” and as a threat to the Sunni world, Washington and Riyadh have succeeded in diverting the focus from the Israeli occupation of the Golan Heights and in the West Bank, to Iran, Syria and Hezbollah. The misguided and perilous instrumentalization of jihadist organizations is reminiscent of the role assigned to Osama Bin Laden’s Mujahideen in Afghanistan in the 1980s. But this time, the US-backed Saudi, Qatari and Turkish strategies in Syria might prove to be exponentially more disastrous. In the wake of this foolish adventure, religious minorities have nearly disappeared in the so-called “liberated areas” in Syria. On the other hand, independent, secular and well known opposition groups such the National Coordination Committee for Democratic Change or even Qameh (Arabic anachronym for Value, Citizenship, Rights), led by the prominent opponent Haytham Manna, have been boycotted by the Western “friends of Syria” and their Gulf allies, and excluded from the political process in Geneva. Many Druze believe that by feeding this war in the name of democracy, Western governments aim at establishing a new “Sykes-Picot” plan and dismantling Syria into sectarian and tribal statelets. The majority of – if not all – Druze favor secularism as the only option that would reunite Syrians and guarantee their rights. The legacy of the Syrian Revolution against the French mandate, that they initiated and led in the 1920s, is strongly present in their collective memory. This cultural heritage, combined with their national awareness, has rooted the Syrian identity in their personalities. 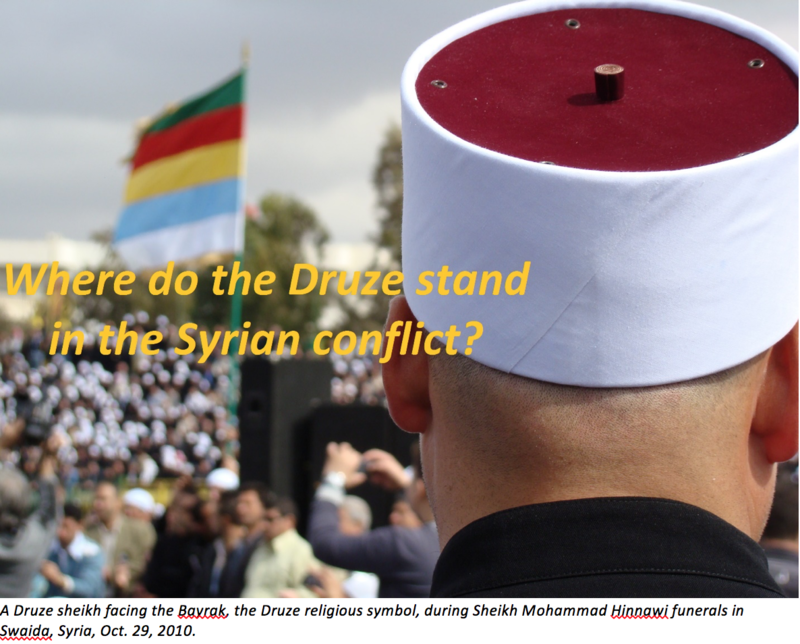 Swaida and Idlib offer two conflicting perspectives for the Druze. While Swaida enjoys a semi-secular system that still leaves room for concern, Idlib’s Druze are struggling to survive in a fundamentalist environment, thus resorting to esotericism by concealing their social and religious identity. The Druze have historically concealed their beliefs from non-Druze following the massacres that took place in Antioch and Aleppo during the years between 1024 to 1031. Known as the Mihna or trial by the Druze, this period remains emblazoned in the collective memory of the community. Mass killings were designed to wipe out the community. 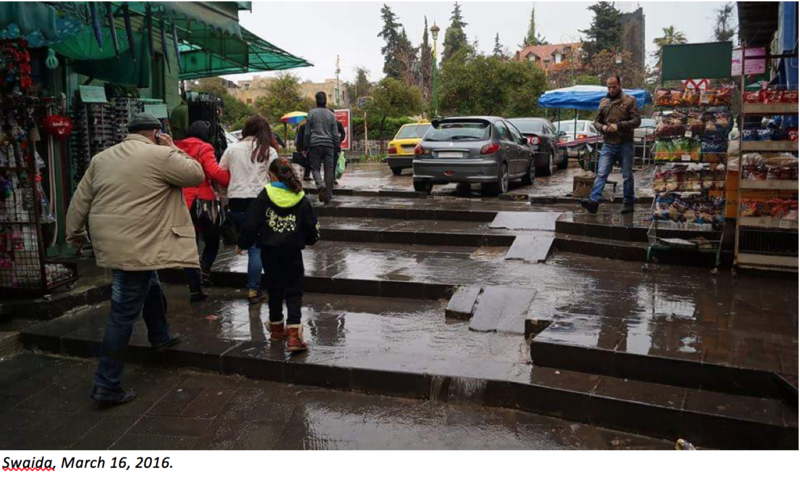 Those who survived went underground and sought refuge in the Syrian coastal mountains, including the Shouf Mountains, Keserwan and Mount Hermon. The Druze succeeded in breaking their isolation and earned recognition from the Mamelukes because of the fierce resistance they put up against the Frankish or Crusader rule in Syria (1099 – 1291). They provided first line contingents to Saladin in the battle of Hittine in 1187. But shortly after the defeat of the Franks, the Mamelukes turned on their former Druze allies. Ibn Taymiya’s incitement against schismatic Muslims led to heavy massacres of Druze, Shi’a and Alawites in the Keserwan. The fatwas and the massacres sent shockwaves through the Druze community, who perceived these acts as treason. The short-lived unity that Druze had enjoyed with the central state came to a swift end. 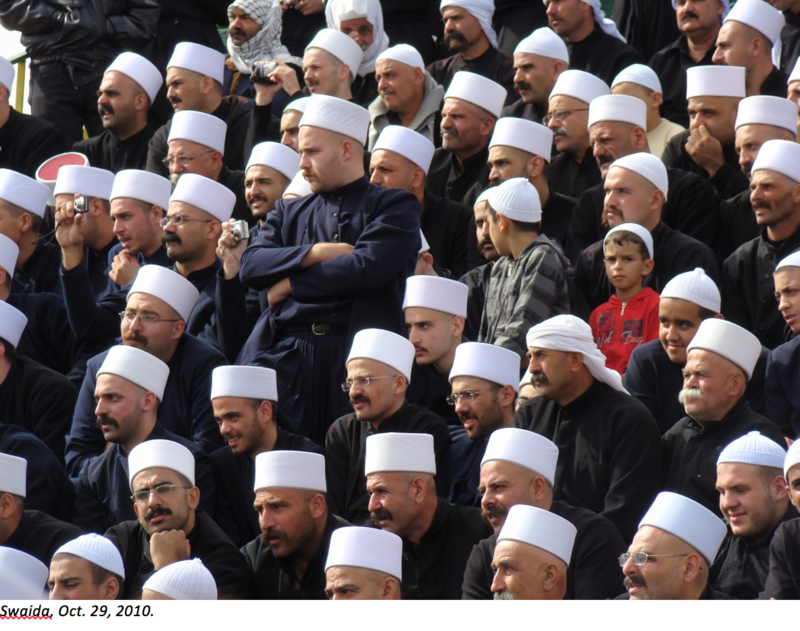 Unfortunately, mutual suspicion between Druze and Sunnis have been hard to quell ever since. The politically-motivated Ottoman campaigns against the Druze led to new massacres in 1585, but failed to subjugate them. They triggered a wave of revolts against the Sublime Porte throughout the 17th and 18th centuries that led to an agreement establishing the autonomy of the Druze in Mount Lebanon. In Swaida, the Druze fiercely defended their autonomy against the Ottoman armies throughout the 19th and early 20th centuries. 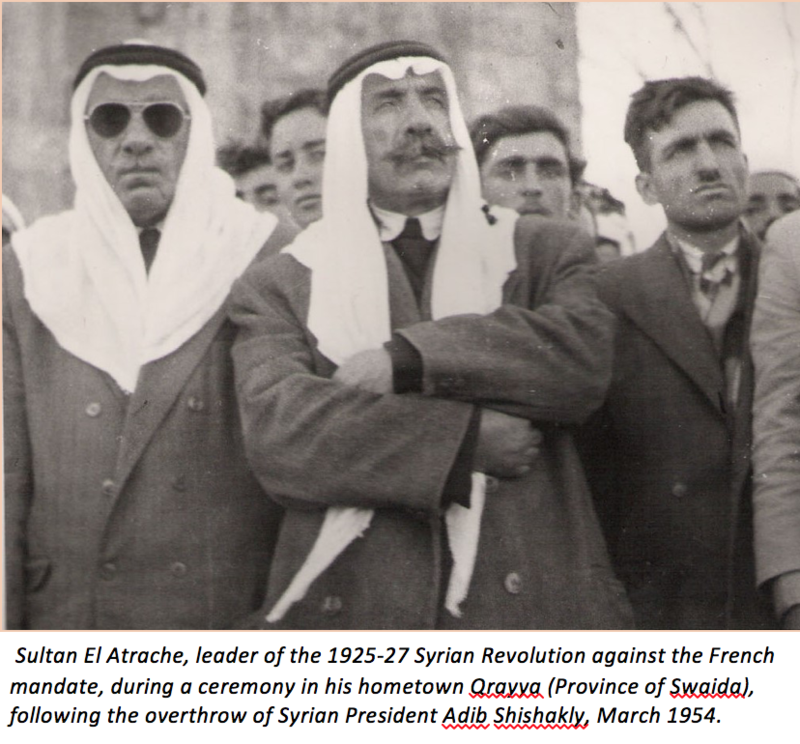 When the caliphate collapsed, the Druze voluntarily abandoned their autonomy for the sake of a secular Syrian state, and led the Syrian Revolution against the French army in 1925-27. They are considered among the main founding fathers of modern Syria. The history of the Levant and the discriminatory ideologies embraced by the Syrian opposition militias explain the position of the Druze in the current war. Druze suspicion of the US-backed “moderates” was well placed. Most rebel militias embraced some variant of Islamist ideology, which dismisses the Druze religion as apostasy or some sort of false creed. Almost all of them have ended up allying with or working along side Al Qaida in Syria that now calls itself Fatah Al Sham. As moderate as they claim to be, the sectarian militias that have emerged since 2011 failed to develop a respectful partnership with the Syrian population, let alone preserving the Syrian identity. The freedom of religion and worship that Syrians had enjoy were abolished in “liberated” zones. Religious minorities were driven from their homes and women harshly repressed. The concept of secularism was rejected by the majority of the opposition. The Druze distrust these militias and their political affiliates. In the current circumstances, they seem determined to support the Syrian state’s institutions, including the army, having contributed to their creation in the 20th century. When the protest movement started in 2011, many Druze professionals, activists and opponents took to the streets peacefully and voiced their support for the uprising. However, these remained a minority. Contrary to the protests elsewhere in Syria that organized in Mosques and places of worship, Swaida’s protesters gathered in public squares and in the streets, in order to mark their secular, national and non-sectarian orientation. But with the internationalization, the militarization and the islamization of the crisis, many opponents viewed the conflict as a struggle for power and turned against the jihadists. Fewer Druze dissidents voiced their support for the Islamist militias. Most of those who did were either expatriates, Facebook activists, or employees on the Gulf sheikhdoms’ payroll. They claimed that rebel attacks against the Druze were either individual mistakes or a plot from the government to scare minorities and to provoke tensions between the Druze and the freedom-loving rebels. For them, the chaos and sectarian cleansings that took place in so-called Free Iraq, Free Libya, Free Afghanistan, in Lebanon during the civil war and in the “liberated” areas in Syria, should not worry the Syrian population in case of a regime change. Even though some of them argue that Deraa and Qunaitra are safe for the Druze, they strictly remain in government-held areas in Syria, and do not dare crossing over to the “liberated areas” – a behavior which casts doubt over their claims. However, the general mood among the Druze is that the government does not need to discredit the opposition or to scare the minorities because the opposition is already doing a good job in this regard. The jihadist attacks, combined with an unprecedented economic crisis, led the Druze to enroll in pro-government paramilitary troops assigned to protect Swaida. But like in any war, the weakening of the central state and the rise of local militias have resulted in a dramatic increase in corruption and some degree of contained “outlawness.” Popular discontent has reached unprecedented levels with unjustified shortages of gasoline and fuel supplies, and the smuggling of weapons, oil and even refugees between Swaida’s pro-IS Bedouins and a handful of corrupt Druze fighters. Impoverished by the crisis, some Druze believed to have some sort of immunity, made a living by smuggling weapons from and to Deraa, which provoked outrage among local communities. In the last few months, rogue elements carried out abductions and assassinations against civilians, sparking protests in Swaida. People took to the streets, asking the government to impose the death penalty in order to put an end to chaos in the province. On the other hand, some issues occasionally cause divisions between civilians and government agencies or officials. The main one is related to thousands of army defectors who hide from the military police. Localized clashes take place sporadically between the military police and defectors’ relatives, who intervene in order to free a conscript. As a result, the government and the Druze dignitaries reached a compromise, allowing the defectors to do their military service within the Province of Swaida. The deal managed to bring relative calm to the situation but it didn’t resolve the issue. The relative success of the paramilitary forces has led many Druze to demand that conscription be abolished and replaced by a professional army. These issues were raised last year by Sheikh Wahid Balous, a Druze cleric that reached notoriety by contributing to the liberation of Deir Dama in August 2014. The weakening of the State created a vacuum that needed to be filled by a political or social entity. This is where Sheikh Balous succeeded. His popularity stemmed from the fact that he was able to mobilize parts of the province’s public opinion by offering his protection to Druze defectors. He also echoed the population’s grievances about corruption, the fuel crisis, and the need for defensive weapons against the jihadist threat. He alternated between cooperation with the Syrian army and defiance of security forces. His ambiguous relations with the Syrian government, with the opposition, and with the Druze in Israel raised questions about his political agenda. At times, he seemed to be in favor of some sort of autonomy in Swaida. He was killed in a bomb explosion on Sep. 4, 2015. Both the government and the opposition accused each other of assassinating him. In the wake of his murder, a press release issued by an undisclosed source demanded administrative autonomy in Swaida. The communiqué was short-lived, but idea hasn’t entirely dissipated. Aside from the old loyalist vs. opposition rift, a third option advocating Druze autonomy has recently emerged in Swaida, even though supporters of such an alternative remain a minority. The weakening of the central government in Damascus, the emergence of an overwhelmingly fundamentalist Saudi-backed opposition in Syria, coupled with the identity crisis prevailing in opposition circles, and an aggressive media campaign pretending that the Syrian government has abandoned the Druze to their fate, have all triggered an isolationist sentiment that remains confined to a minority within the Druze community. Aside from the opposition’s thoughtless propaganda, the Druze autonomist drive has been discreetly promoted by Israel and countries of the so-called “Friends of Syria” group, which appears to be indifferent to the possibility of seeing Syria, Iraq, Libya and Palestine imploding or disappearing from the world map. Until June 2015, Israeli hospitals had been treating wounded fighters from al-Qaeda’s Nusra Front (Haaretz, “Israel halts Medical treatment for members of Syria’s Nusra Front, Jul. 20, 2015). According to the Israeli media, more than 2000 jihadists were admitted to Haifa, Safad and Nahariya’s hospitals. The Israeli army has supplied Salafist militias with ammunition, military equipment and communication devices. It also engaged in signal jamming and communication disruption against the Syrian army during jihadist offensives, like in Tal al-Hara, captured by al-Nusra on Oct. 7, 2014. Israel even downed a Syrian military aircraft on Sept. 23, 2014, during combats between the state army and al-Nusra. Since 2012, Israel has been actively supporting the same jihadists that have attacked Druze villages in Mount Hermon and in Swaida. On the other hand, Tel Aviv has launched a fierce psychological campaign aimed at pushing the Druze to seek protection from Israel against these very same jihadists. But on the ground, Israel has repressed and jailed Druze activists who oppose Israel’s support to jihadists. On June 22, 2015, a Druze crowd attacked an Israeli military ambulance that was rescuing two jihadists, killing one of them. As a result, Tel Aviv arrested 9 Druze from Majdal Shams. Two of them were sentenced to jail. When the “Southern Front” attacked Swaida and Mount Hermon, dozens of Druze activists stormed Israeli hospitals that were harboring Syrian jihadists. Earlier in February 2015, Israel arrested activist Sudki al-Makt, a former Druze prisoner from the occupied Golan Heights. Al-Makt had spent 27 years in Israeli jails for engaging in military resistance against the occupation. He was released in 2012. In April 2015, he was indicted in martial court after he posted on Facebook a video showing Israeli soldiers rescuing Syrian jihadists on the Syrian-Israeli ceasefire line. 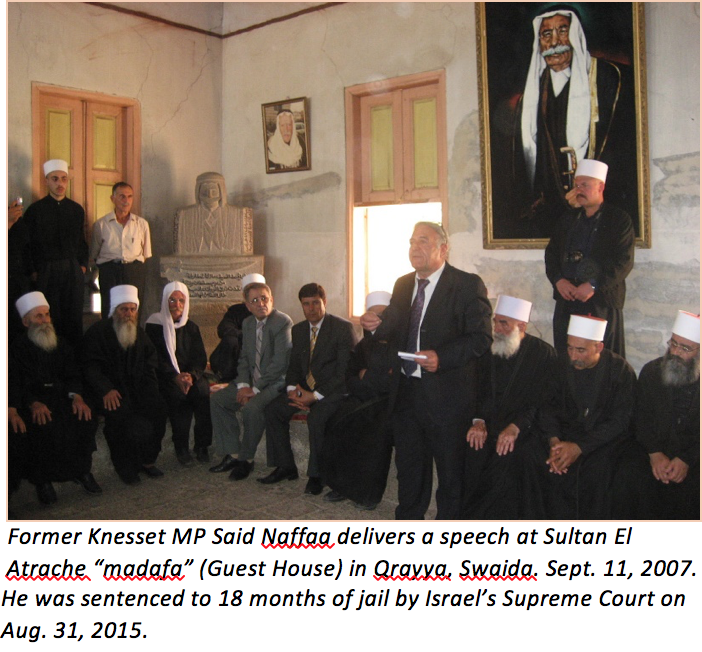 On Aug. 31, 2015, Israel’s Supreme Court sentenced former Kenesset MP Said Naffaa, a Druze lawyer from Galilee, to 18 months of prison for organizing a visit to Swaida, Jaramana, and Damascus with 250 Druze Sheikhs from Mount Carmel and Galilee. In spite of that, Tel Aviv is posing as the sole protector of the Druze. It has been trying to reach out to the Druze in Mount Hermon and in Swaida through Galilee’s Druze dignitaries and activists that are closely related to the Israeli government, like spiritual leader Muwafak Tarif, Druze members of Netanyahu’s government, and other activists. Their intention is to build bridges with Syrian Druze dignitaries and influential personalities. Such efforts were accompanied by “Druze conventions” and meetings in Jordan, Spain and Turkey, and were designed to convince the Druze to follow the Kurdish path and fight for autonomy with the military support of Jordan, Israel, and the United States. Western governments have been testing the waters recently. In July, British diplomats met in Turkey with Druze activists and expats from Swaida, Mount Lebanon and Galilee. They also met in Lebanon with pro-Syrian Druze dignitaries. The Britons suggested to set up a Druze military force similar to the 2007 “Iraq Surge”, in order to fight along with the American coalition against the Islamic State. The proposal, that leads inevitably to provincial autonomy, followed by secession, wasn’t welcomed by the Druze, albeit with some exceptions. Since 1948, Tel Aviv has been reiterating its interest in dismantling Syria and creating a Druze buffer state from Mount Hermon to Swaida, thereby ensuring Israel’s northern border protection in the long run. In a replay of Southern Lebanon’s scenario between 1978 and 2000, Tel Aviv’s objective seems to be the establishment of a Druze puppet state, led by a Druze version of Antoine Lahad, willing to split Swaida from its Syrian motherland, to fight for Israel in the long run and to link the Druze fate to Israel’s existential crisis. One of the tell-tale signs of Israel’s growing interest in a Druze statelet is the request made by Israeli Prime Minister Benjamin Netanyahu to the Chief of Staff of US Army General Martin Dempsey in June 2015, which consists of providing military support for Syria’s Druze, and particularly for Mount Hermon and Swaida. The overwhelming majority of the Druze have sided with the government’s army for existential and identity reasons. They see themselves as the protectors of Syria’s southern borders, as well as the first line of defense of the Syrian capital Damascus, both in Swaida, in Jaramana, and in Sahnaya. The Druze played a crucial role in sparing the city of Damascus from the same bloody fate as Aleppo after the fall of Jarablus, Menbej, and Al Bab in 2012. In the army, the Druze have lost approximately 3000 military men. Most have been killed in Aleppo, Homs, Idleb, Raqqa, and in the Damascus suburbs. 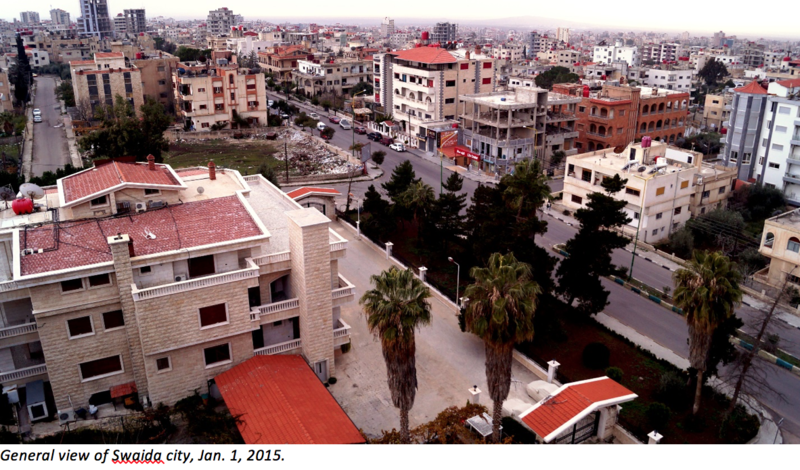 While the desertion rate is high, Druze conscripts can be found on most fronts in Syria. Many Druze officers in the Syrian army distinguished themselves during the war. This is the case of Major General Issam Zahreddine, a commander in the Republican Guard that has led the Syrian army in the besieged city of Deir Ezzor since 2013. Fighting alone, and without any foreign assistance (at least until Russian’s aerial intervention in September 2015), Zahreddine’s troops have succeeded in blocking all attempts by the Islamic State to invade Deir Ezzor, home to 300,000 Syrians. 1- The sectarian nature of the Syrian opposition and the presence of jihadist organizations on Swaida’s western and eastern borders compel the Druze to constantly mobilize a defensive paramilitary force in coordination with the Syrian army. The downside of this approach is the abuses of power by a limited number of militiamen who engage in activities such as smuggling. 2- The influx of refugees fleeing both rebel-held areas and the Islamic State adds pressure to overwhelmed municipal services and raises fears of possible rebel infiltration, much as took place in Raqqa and Idlib before the ultimate jihadist takeover in both cities. 3- Israel’s policy vis-à-vis its jihadist allies and the Druze poses a real threat to Syria’s survival as a unitary state and to its national identity. All these threats have been contained by the Russian intervention in Syria. Moscow has stabilized most fronts while giving considerable leverage to the Syrian army on the ground. The Russian aerial coverage, as well as the coverage of the Syrian Air Force, enhanced as it has been by recently acquired jets, provide a military shield to Swaida and to other government controlled areas that are home to 14 million Syrians, half of which are internally displaced Syrians who have fled from opposition-held areas. The protest movement that started in 2011 has quickly been muted and transformed into a struggle for power that has nothing to do with democracy anymore. The Druze consider themselves to be Syrians. They perceive their religion as a sub-national identity, not as a nationality in its own right. They are an essential part of the Syrian identity. This is a legacy of Sultan Pasha al-Atrash’s pioneering role as leader of the Great Syrian Revolt of 1925-1927. The majority of Druze refuse to be cut off from the rest of Syria for economic, cultural, and identity reasons. A Druze statelet isn’t sustainable and would be destined to become a puppet enclave to either the Hashemite Kingdom or Israel, both of which don’t offer better prospects for the Druze than Syria. 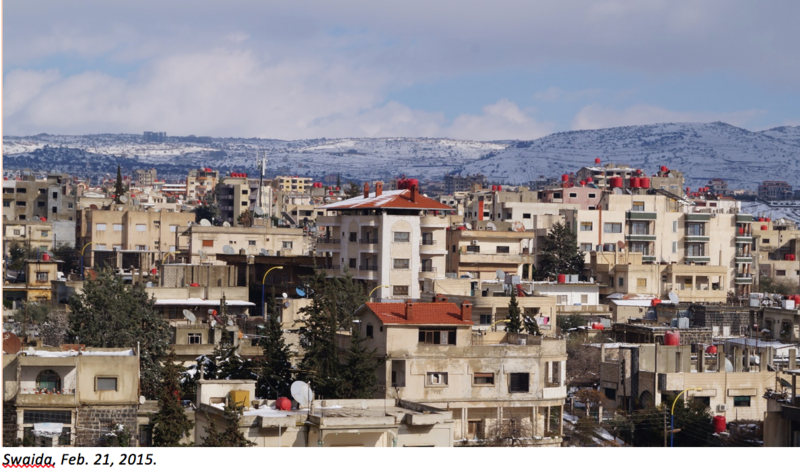 While the Druze public opinion on the war is polarized, many still want to believe in a settlement that would preserve what’s left of Syria, or one that would restore the status quo antebellum. *Talal El Atrache is a Syrian journalist and writer. He worked for many years at Agence France Presse (AFP), and as a correspondent at Radio France Internationale. He has also been a freelance journalist at l’Humanité newspaper, TV5 and BFM TV (French channels). In 2007, he was awarded the Lorenzo Natali Media Prize by the European Commission. He is the co-author, with Richard Labévière, of “Quand la Syrie s’éveillera” (When Syria Awakes), published in 2010 by “Editions Perrin” (Paris). All photos were taken by Talal. So Israel, like the U.S., betrays the Syrian factions that they say they support, like the U.S. has done with the Kurds? will this onslaught of murder/mayhem continue? If Assad lost, all these minorities would be exterminated. There is no alternative. Maybe they can make one after they defeat Nusra and ISIS, (fat chance), but there is none now. The fact that Mr. Attrache is familiar with the details of the developments in Syria in general and in Swaida in particular is not in dispute. It is equally clear that this informative piece by Mr. Attrache is more of an account of what took place on the ground rather than an analytical and theoretical presentation. What I find a little bit troubling is not the fact that the Druze seem to have wanted to support the FSA and the opposition in 2011 but had a change of heart when JAN committed its atrocities against them ; to oppose vigorously JAN and its affiliates makes perfect sense. If the above is true then the Druze support for the regime forces is essentially a marriage of convenience instead of one of shared values. This I find very troubling since I find the logic of supporting actively the lesser of two evils a wanting one. Why not sit the conflict out or seek a third way ? It is commendable that the Druze in Syria are not interested in a statlet of their own since they share the greater Syrian identity but this must not imply supporting a system of governance with which they are at odds. 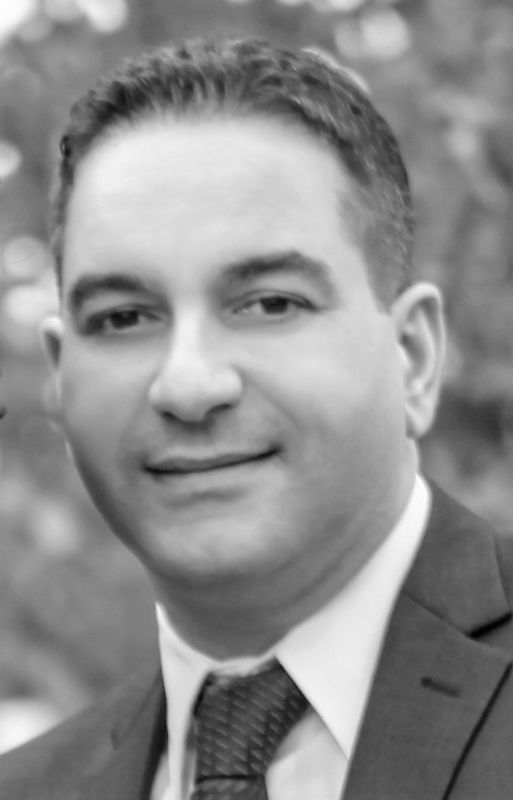 This is a superb article by Mr El Atrache and thank you for posting it, Mr Landis. It was fascinating to see the Druze perspective, since this has been largely missing in the MSM. The Washington narrative which has dominated Western media since the start of this terrible conflict is increasingly being seen as yet more monstrous propaganda like that which spawned the Iraq fiasco. Assad’s government was undeniably brutal, corrupt and unpopular, but is unquestionably better than the Salafist alternative. Not just Druze, most Syrians who oppose rebels are not doing that because they love the regime but because they realized that rebels are actually worse than the regime. Nawaf al-Bashir from arab tribes reportedly has left the opposition for the same reason. It is common sense but many boneheads here just do not get it. Rebels are pimps for the GCC and Turkey, they do not have a Syrian agenda and their pool of supporters will keep shrinking. Assad will not be president forever but the filth brought by islamists can stain and drain Syria for decades and that is why islamist rebels should not be allowed to prevail. Israel is not your enemy, Mr El Atrache. Islamists are. Druze who are Israeli citizens here thrive and are doing very well. They are respected citizens who enjoy every right that I as a Jew enjoy. This will never happen to a Druze living under Islamist rule. Even Druze people in what you call occupied Golan, are thankful. Trust me I know some. Druze is just like Yazidi in the eyes of Islamists. So good luck. In the future I fear you will need Israel’s help. Being more friendly with Israel might help. Turkey said their troops in Syria are for the long run ,and offered to evict IS from Reqqa, if Turkey fight IS, US can not be against Turkey, and US would not need YPD anymore, Kurds will be the losers. Veteran Israeli intelligence analyst Yossi Melman has described his country’s efforts to eliminate BDS as something akin to military operations. Writing for the daily Maariv last weekend, Melman said Erdan’s ministry is leading “defamation campaigns, harassment and threats to the lives of activists” in a way more similar to “black ops” or “special operations” than an intelligence-handling ministry. Israel’s Public Security and Strategic Affairs Ministry director general Sima Vaknin-Gil has also recently said she wants to “build a community of warriors” to resist campaigns like BDS. The ministry’s most recent recruitment push has been fully classified, with the role of its 25 new employees hidden from Israeli taxpayers and the international community. It is also unclear how much of the department’s large budget has been allocated to anti-BDS work. I’ve looked at the old religious books of the Alawites and Mandaeans and to the extent they still exist, the Samaritans. A lot of parallels to the historical Jesus, not in the Christian Bible, by the way. A hobby. I need to look at the Druze. First, that all these little ancient religions and ethnic groups have survived under Islam. All the little religions in Christian Europe were exterminated. Bravo Islam! Second, after all these centuries, all those little religious/ethnic groups are being exterminated or driven out under Islam. And often, like the Mandaeans, being given sanctuary in the Christian countries. Bravo Christianity! And for instance, the Mandaeans, it was Saddam, it was the hacks that replaced him, and the Iranians, all bringing the hammer down, there’s no one guilty party. It’s not just relative to the Christians, it’s absolute, all these little groups survived up to now. what syrian motherland? what is syria? Is it not merely the product of colonial intrigue? The civil war that began 5 years ago merely proves the fallacy of this construct, which crumbled absolutely. 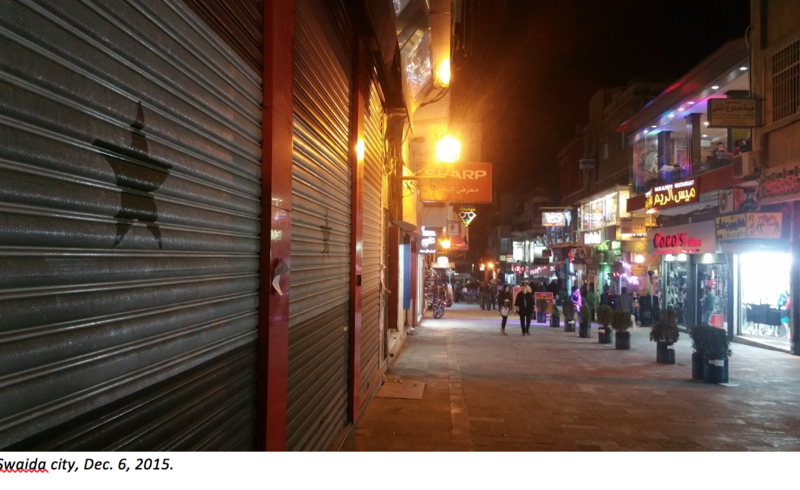 Its baathist pillars were nothing but bamboo sticks merely waiting for the chance to crack. The Druze seek a national entity to support. It is their nature to find a supra-ethnic/religious entity that finds it in its interest to sustain the community. In Irsael that is the case. In Lebanon, even, that remains the case, as epitomized by their disproportionate role in the political system. In Syria, that may have been the case during the 50s and 60s, but not so much after the Assads took power. In both Israel and Lebanon, Druze individuals have been appointed to government, administrative and military posts at the highest levels. In Syria, the most prominent Druze is a general of the Republican Guard who essentially gained prominence because he was not killed after being posted in a battlefront everyone thought was a lost cause. Finding a Druze minister of any consequence throughout the last 5 decades of Assad rule remains a challenging exercise. Today, we have an over-glorified secretary playing that role. Moreover, the Syrian army’s role in the Tha’aleh battle was marginal. It was the militias who defended the airport and prevented the army from abandoning their positions. There were even rumors that the officer in charge was bribed and in turn agreed to abandon the base. The battle of Deir Dama was one fought by the masheyikh, not the army, nor loyalist paramilitary forces. You overplay the Druze role as a buffer protecting Damascus, in the interest of increasing their relevance to the regime. Sweida in no way blocks anyone’s passage to Damascus. Even the most remote village on the Sweida Damascus highway can do nothing to prevent entire armies from moving between Deraa and Damascus. It takes at least 30 minutes to drive from the Ebla Sham Palace to Buraq driving 100 km per hour. Tell me: what can Druze militias do in this case? Maybe attack a conquering army’s flanks? Harass it? Attack Deraa after the opposition takes Damascus? If the opposition took Damascus, they wouldn’t give two hoots about Deraa! Jaramana, and Achrafieh really stopped the rebels? Come on man! All those two districts really did was protect themselves. Nothing else. I’ll give it to you that they relieved the state by allowing it to deploy fewer resources in the city. However, the fall of Damascus was prevented by an international agreement to prevent its falling, and nothing else. It was not the Druze, and will never be the Druze who protect Damascus. So you assert they have several options: what are they? 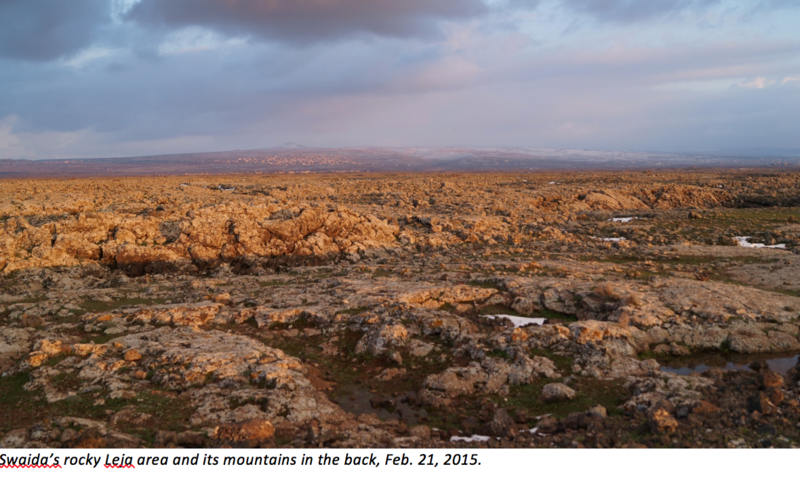 Well, like the Alawite mountains, the Druze mountains cannot survive as an isolated entity. It think you assert that clearly. A state as large as the Syrian one (prior to 2011) suited the Druze merely because it could subsidize the region, offer state jobs, invest in its development, facilitate trade, provide services such as electricity, gas, petrol, etc…. If there was an ideological attachment to those material benefits and a wider benefit for the Druze themselves in the Arab world (the Arabness of the Syrian Arab Republic), then its long gone, and its time we all see that. 1. Their legacy: Sultan Pasha el Atrash’s legacy in particular. It’s a good one. A proud historical moment in their favor. 2. The Jordan option. From a material standpoint, they would go from bad to worse. Joining a country of 5 million people, with a relatively poor state would definitely be taking a step down for the Druze of Hawran. 3. The Israel option. It’s bad enough that the Israelis make it a point to plaster Druze officers, knesset members and government employees all over web as evidence against the argument that they are an apartheid state. The abuse the entire community has received since 1948 for accepting the Israeli state and correspondingly meeting its obligations towards that state cannot be measured. One should make a note here that Sunni Bedouin and Circassians also serve in the Israeli military, and in greater numbers, but that is another subject and debate. Going back to the original point however, the Druze would expose themselves to even greater derision, abuse and possibly bloodshed from their non-Jewish neighbors if the Hawrani Druze also acquiesced to Israeli designs. Up to this point in history, the Druze of Lebanon and Syria have been able to argue that although their cousins in Israel have served the Israeli state, they too have served both Syria and Lebanon and shed blood for “Arab” causes. That argument would loose its validity if two of the three geographically distinct Druze communities in the Levant joined forces with the Israeli state. Whether this calculation changes in the near future remains an open question. As the broader Middle Eastern conflict progresses, it appears that the Gulf Arab states continue taking discrete steps towards normalization of relations with Israel, and that Iran has taken the spot as “Enemy #1” in the eyes of Sunni Arabs. Assuming this trend continues, then the Druze will have to choose with whom to associate themselves: Iran or Israel (Sunni or Shi’a). The Alawites appear to have chosen. Given these bleak options, the Druze of Hawran still cling to their Dreams of returning to the status quo ante – however remote and improbable these are. They will continue arguing that a Syrian state exists – free, independent and able to dictate policy not only at a local level, but also a regional level. Why? Because it is the only way they can avoid choosing between Sunni and Shi’a – between Iran & Israel. I honestly hope they can continue on that path despite its inherent contradictions and fallacies. Why? Simply because a minority like the Druze cannot survive by making enemies. They know that. Over a thousand years of history filled with warfare and massacres has taught them that. I think that you overstate the bad conditions for druze in Israel. they have the same autonomy in their towns as any other town, most of the men serve in the army, have equal voting rights and have a lot better economical conditions than the druze in any other middle-eastern country. dear Sweida Who, Can I publish your comment on page one? I think it would make a great post. Raises many important questions for the Druze. I think Israel and their “jihadist allies” should break bread together to prevent the jihadists from chopping off Bashar’s long neck. Bashar couldn’t protect his citizens. He failed. He should sell his candlesticks and leave the country.